The 100th edition of the Tour de France is currently underway, with two more weeks of exciting action still to come before the finish on the Champs Elysees in Paris. This week we’re celebrating this historic race with a very different kind of bike to the lightweight super aerodynamic machines today’s riders use. 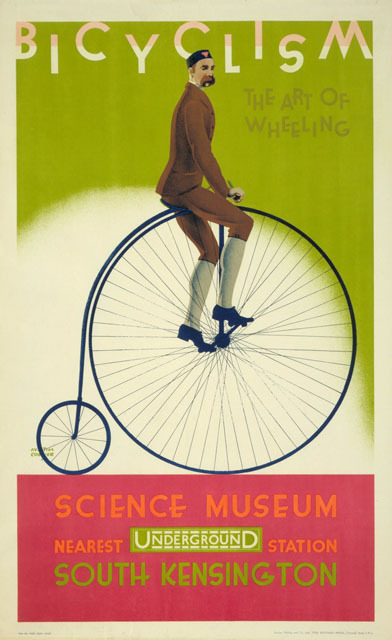 Instead, Austin Cooper’s 1928 poster takes a nostalgic look at the ‘penny-farthing’ or ‘high wheel’ bicycle, popular in the late Victorian era. The penny-farthing’s design followed on from the ‘boneshaker’, the first popular and commercially viable bicycle with pedals. The large front wheel of the penny-farthing enabled greater speeds in a time before gears had been added to bikes. The big wheel on the front also led to a smoother journey over cobbled streets, before bikes featured pneumatic tyres. However, the penny-farthing was not without its dangers and was soon replaced by the safety bicycle, launched in the 1880s and featuring a chain driven back wheel. 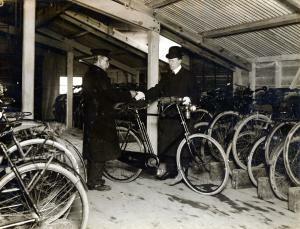 From here on, the bike became a popular, safe and affordable means of travel for men and women.